A Pinch of Salt, A Dash of Sass.Tuscan Pork Riblets with Balsamic-Dijon Glaze - A Pinch of Salt, A Dash of Sass. C’mon, y’all, let’s get some ribs! We’ve talked about pork spare ribs before, and they’re one of my favorite cuts on the hog. I find them to be more flavorful than baby-back ribs, but even if that’s your preference you can make this work. We’re going to get these fantastic slabs of ribs, and have them cut into … well, smaller slabs of ribs. I am fortunate to be able to get my spare rib(lets) locally from a provider who already has them cut into these bite-size wonders, but if you don’t, don’t despair! Pick out your slab of ribs and just call over the butcher or meat counter man, and tell him you’d like your slab of ribs cut up. 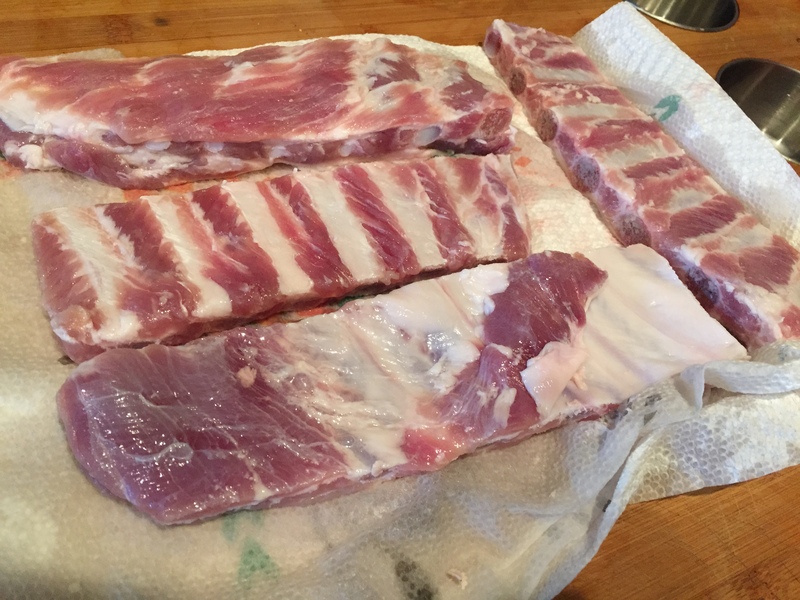 These riblets I’m using are sliced the long way, AGAINST the grain of the rib bones, so one normal slab of ribs can turn into three or four, thin, strips of ribs. That’s what you want. Two, two-and-a-half inches per strip is perfect. They’ll do this for you, and probably at no charge. Don’t try to cut them up at home unless you have a spare band saw laying around that you feel like taking apart and scrubbing when you’re done, you know, carving up pork. Just have your provider do it and you will be very glad you did. Spare ribs, cut into riblets. The long and short of this super-delicious version of Tuscan pork riblets, is that it occurred to me almost as they were finished, that they are an excellent finger food. Who needs buffalo wings when you can have delicious roasted pork? Imagine these on your playoff party spread or as a unique treat to bring to that holiday pot-luck. Folks will be banging down your door to ask you how you did it — and then, because you and I are friends, see, you can send ’em here and we’ll all be friends together! Great for a simple dinner, great for a treat for a crowd, a snack, and they’re fantastic the second day, too. Tuscan (Italian) Riblets. You know you want to try them, and I can’t wait to hear what you think of them! Let’s do it! Slicing racks of ribs across the bone into 2" strips provide the perfect mechanism for a delicious, unique finger food or main dish. Italian seasonings and a slow roast make them tender and delicious. Thaw your riblets, if they're frozen. Remove them from any packaging and give them a good rinse. Mix up a brine (6 tbsp of salt per quart of water) and immerse your riblets in the brine and keep them there, refrigerated, for a good two hours. This helps the salt penetrate the meat and will keep your riblets moist during the roasting. After two hours (or more is fine, whatever is convenient for you up to overnight) remove them from the brine and pat them dry on paper towels. If your ribs still have the membrane on one side, we need to remove that. On the "back" side of the ribs, if you can see the thin film layer that runs along the ribs, carefully slice it with a very sharp knife at one end of a rack of riblets. After you have sliced through only the silver skin layer, carefully scrape and start to lift it away from the ribs. When you have enough of it to grab, using a dry paper towel, grab the film tightly and strip it off the rack of ribs. Repeat this with all your little racks of riblets. Removing this membrane lets marinades penetrate the meat and it's also unpleasant to eat it when it's left on. When all of your riblets have lost the membrane, mix all the dry spices in a bowl together and then add the olive oil to make a paste. Using your hands (I wear gloves for this step) smear the ribs all over, front and back, with this olive oil and herb/spices paste. Lay them flat in a container and refrigerate them for at least two hours. About three hours before you plan to serve your riblets, bring them out of the fridge and let them come towards room temperature. Preheat your oven to 300 degrees. When the oven is hot, put the ribs, in a single layer in a roasting pan and add the cup of white wine to the pan (don't pour it over the ribs, or you will rinse off all the spices). Pop them into the oven on the middle rack, uncovered. Check after an hour and flip them them over. Put them back in for another 30 minutes, then check them one more time and drizzle them with balsamic vinegar. Return to oven. After 2 hours, the ribs should be pretty tender -- if they aren't, let them go another 30 minutes if you'd like. Remove them from the oven. Pour off all the juices and wine into a saucepan, and cover the riblets pan with foil. Add the dijon mustard to the saucepan and whisk until it all emulsifies, or comes together into a sauce. Reduce over medium heat for 5 minutes. Transfer riblets to a cutting board and carefully slice in between the bones, to make individual riblets. To serve them family style, or as an appetizer for a group, put them all into a big bowl and drizzle the mustard sauce over the top of them. Serve immediately. These are also great as a main course with some warm bread for sopping up the sauce, and a nice green veggie. Enjoy!